The WHO's courtship of China reflects a desire to answer a critical concern: global health’s need for new partners and more funding. For tuberculosis control, China's increased role in global health can be particularly effective, even if there are shortcomings. The following is a guest post by Sean Joyce, a former intern for the Global Health Program at the Council on Foreign Relations. 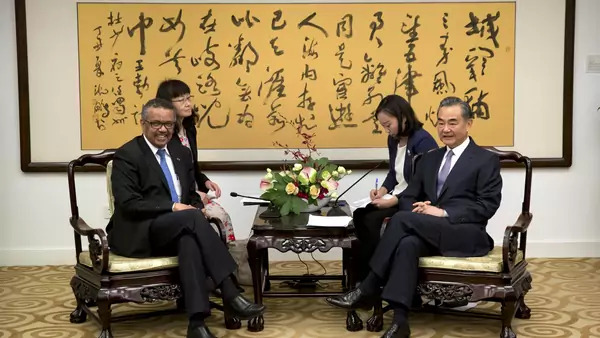 In July, World Health Organization (WHO) Director General Tedros Adhanom praised China’s efforts to integrate health into its economic partnerships. Tedros’s praise for China comes amid flat-lining WHO donor funding since 2011 and projected annual funding gaps in excess of $50 billion for HIV, tuberculosis (TB), malaria, and reproductive, maternal, and child health through 2030. As the world’s second-largest economy, many have identified China as a potential counterbalance to this worrying funding shortfall. Tedros’s courtship of China reflects a desire to answer a critical concern: global health’s need for new partners and more funding. In recent years, China has expanded its support for global health. Its health official development assistance between 2011 and 2014 was eight times higher than between 2001 and 2004. The Health Silk Road, established in 2017, intends to further augment its health spending and strengthen health and research cooperation between countries within China’s Belt and Road Initiative (BRI). As China’s most comprehensive global health plan yet, the Health Silk Road reflects the country’s interest in expanding its global health and science diplomacy. China can best realize these interests and close the global health funding gap through aiding in the global tuberculosis infection control effort. Tuberculosis (TB) is a particularly serious global threat, affecting over 10 million new people each year and killing more than any other infectious agent. To counter TB, the United Nations has targeted its elimination in the Sustainable Development Goals, and the WHO and Global Fund both pursue aggressive TB elimination programs. However, TB’s $2.3 billion annual funding gap continues to grow as donor support stalls. To fill the expanding void in these international anti-TB efforts, China can leverage its infrastructure-based health aid, domestic experiences, and burgeoning research capabilities. China’s global health efforts have historically had strong economic considerations, with 57 percent of China’s health aid projects in Africa from 2000 to 2013 allocated to infrastructure and equipment projects. For TB control, these initiatives can be particularly effective. TB control must rely on large-scale detection and targeted treatment of infected individuals, rather than mass vaccination campaigns, due to the TB vaccine’s limited effectiveness in adults. The sheer size of TB’s burden leaves over 3 million TB cases unreported each year. Moreover, the TB-causing bacteria often cause latent infections, which require prolonged treatment to prevent actual illness. The lack of access to medical care in developing countries also causes TB cases to go undiagnosed or untreated. Studies in Ethiopia found that patients farther than ten kilometers from a tuberculosis treatment clinic were nearly four times as likely to delay treatment by more than thirty days and were nearly six times as likely to abandon TB treatment, compared to closer patients. By constructing medical facilities capable of treating TB, China could address this critical barrier to TB control. Still facing a high TB burden of its own, China can also share its accumulating experience in TB control. Between 2006 and 2013, China ramped up its multi-drug resistant TB (MDR-TB) programs from just two sites to at least one in nearly every province. China’s doctors and treatment capabilities are also effective, boasting a 94 percent TB treatment success rate, the second highest among high-burden countries. In addition to applying existing technology effectively, China excels at developing novel medical countermeasures. Its TB research output increased six fold from 2007 to 2016, a faster rate than any other country. The National Natural Science Foundation of China is now the second largest funder of TB research globally, only surpassed by the National Institutes of Health in the United States. Chinese companies currently have a therapeutic vaccine (Vaccae) in the final pre-licensure phase of clinical trials and have had five TB drugs pre-approved by WHO since 2016, second only to India. These contributions vitally contribute to global health, as the current End TB goals will only be met with the development of more effective vaccines and drugs. The WHO’s desire for China to capitalize on these qualities extends beyond Tedros’s statements. In fact, a WHO delegation attended China’s Health Silk Road Communique and promised close cooperation with China’s BRI. With the first-ever United Nations High-Level Meeting on Ending TB on September 26 and renewed interest in TB control, China, the UN, and the WHO have an opportunity to realize China’s potential in the field going forward. China’s health aid does have its shortcomings, typically excluding civil society and humanitarian concerns and inadequately staffing the hospitals it constructs. Nevertheless, China does have certain critical pieces already in place to tackle global TB control. As Tedros hopefully remarked, China’s Health Silk Road “has the potential to alter the course of development for 60 nations.” Nowhere is this as true as in fighting TB.